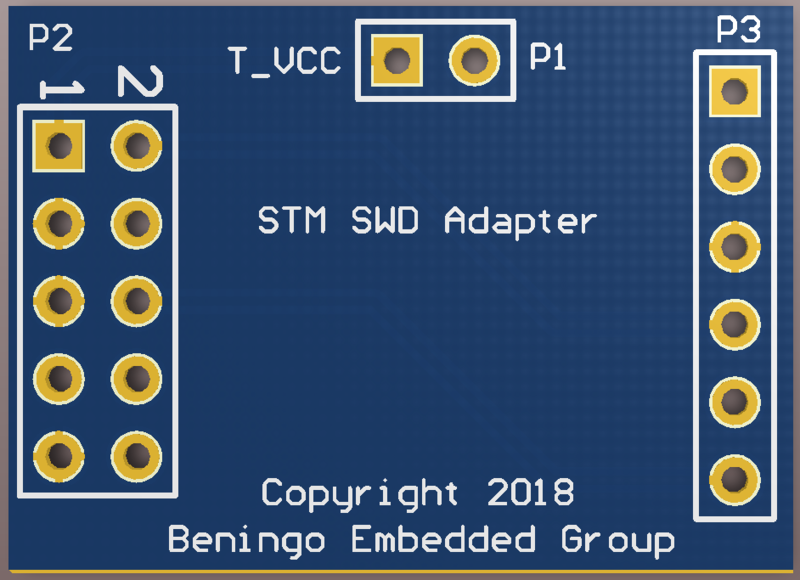 In the last post, we started to look at how we could design a simple programming adapter for STM32 development boards. We walked through the process necessary to get the schematics completed. In this post, we will examine the the PCB layout along with the BOM and costs necessary to prototype this simple board. With the schematics completed, the components and nets are pushed into the PCB document literally with the press of a button. There’s not much there. Literally three components with nets that are ready to be routed. I don’t want to spend too much time talking through PCB layout since it’s really beyond the scope of these posts. With that in mind, here are a few bullets on the process that I follow when laying out the board. As you can see, using two layers, routing these signals is very easy and was possible without having to add any vias! In this model, we are looking at the top layer. On the left, the 10 pin connector would be mounted on the top along with the two pin, male connectors. P3, which is a female connector that connects to the target, will actually be placed on the bottom of the board. Component P2 could be very different for developers depending on the cabling that they use on the programmer. I chose to use old school IDC connectors. The connector BOM cost is not more than $1.50. I added a IDC cable, just in case I didn’t have one, to connect the external programmer to the adapter board. The pricing for the PCB is not listed here. As it turns out, the PCB cost is the largest expense if you are doing a small board run. I poked around and found that for ~$100, including shipping, I could build around 50 boards. This is great if you are planning to manufacture these devices but I really only had interest in building 5. So overall, each adapter will cost me around $25 which is well worth the investment to clean-up the way that I’m interfacing to a development kit. Could I have done this cheaper? Absolutely! I could have just purchased several $1.11 cables, cut off the connector and then directly soldered the cabling onto the P3 connector. I would still need to add the VCC jumper, but some nice cabling could have been built for probably $5 plus some time at the soldering iron. But let’s be honest, that’s not as fun as laying out a board. I hope that these two posts have given you some ideas on how you can interface an external programmer to the STM32 development boards. Obviously these ideas could easily be applied to any vendors development boards. Thanks for a nice writeup. 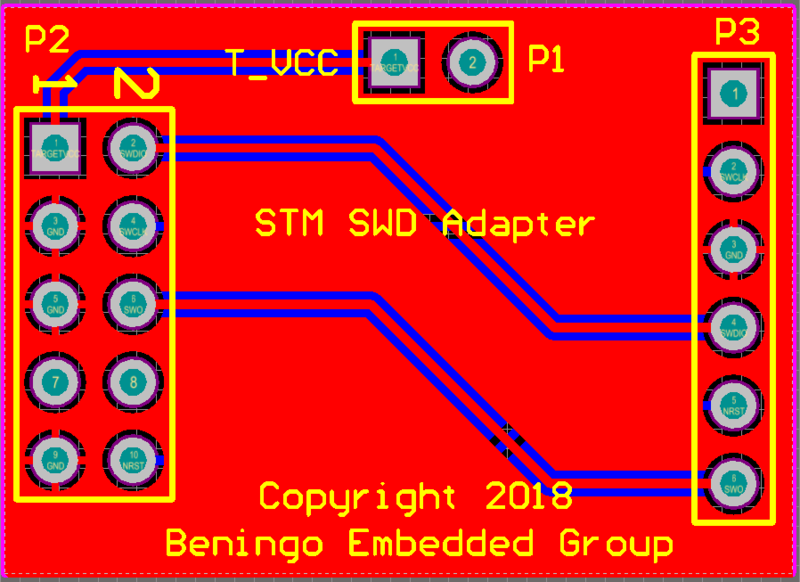 After having to digest all this information on my own, I decided to adopt TagConnect TC2030 connector-less adapters in my designs. It is great for PCB prototypes because it uses needles which take almost no space on custom PCBs. Using TC2030-NL (no lead) cable version, future manufacturing process allows fast and painless batch programming. It is investment in the start, but it pays off in the long run. After seeing how much similar adapters cost, I even made my own “Cortex-M JTAG Interface Extender” board with JTAG-20 IDC connector on programmer side and RJ12 connector for TC2030 cable on the target side, plus some extras. I am using it with J-Link and external genuine STLink programmers. Thanks for the comment. I love the TagConnect adapters! I use them as well on as much as possible. I only wish that ST Microelectronics had put them on their development boards! 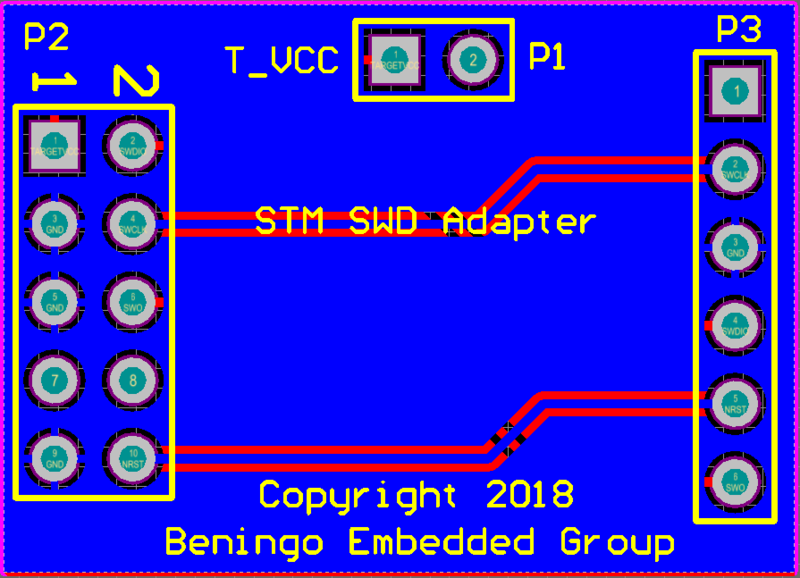 Yes, the 20 (2×10) IDC pin standard solution is slightly too big for modern designs, and a half of pins are just for GND (probably designed for longer cables: GND @ every other line as a result of the pin layout may probably help to eliminate crosstalk between them). Smaller connectors designed for shorter cables may /shall work equally well. But an issue shows up: there is a need (a lack of a) standard pinout, so application engineers can buy those $2 solutions rather reinvent a wheel (a time to figure it all out and put it into a practice costs hundreeds of $…). Would T821110A1S100CEU (2×5 pin IDC) connector serve for the purpose, or there would be better industry standard options aroud ? Thanks for the comment! They are very big for todays designs but unfortunately quite a few Debuggers/Programmers still use them. It then becomes a challenge to find an existing adapter sometimes, which drove this post. On any of these you definitely want to make sure that the SWO line is available. That trace line is so important for debugging. The pin-out you mention looks similar to what I had done but again, it may depend on the exact board or setup that you have in your lab. I’m also pretty bad at connectors so while the T821110A1S100CEU looks like it would work, I would buy one just to test it. I ended up doing that for my setup. Still waiting on my PCB’s to test …. Where did you end up getting your PCBs made? This time I used a place called PCBcart. I used to have them do my prototype boards several years ago because the quality was good and the boards were inexpensive. This time though, quality was good but the cost was much higher. I’ll be posting a blog soon on several quick turn prototype PCB houses that developers can use. That would be a very helpful list of PCB houses too.